I know, I’m a big fat cheat. As you might imagine, this isn’t a recent photo. For a variety of reasons outfit shots are in short supply at the moment but I wanted to write a post about boho tops, so I’ve resurrected an outfit from last summer. 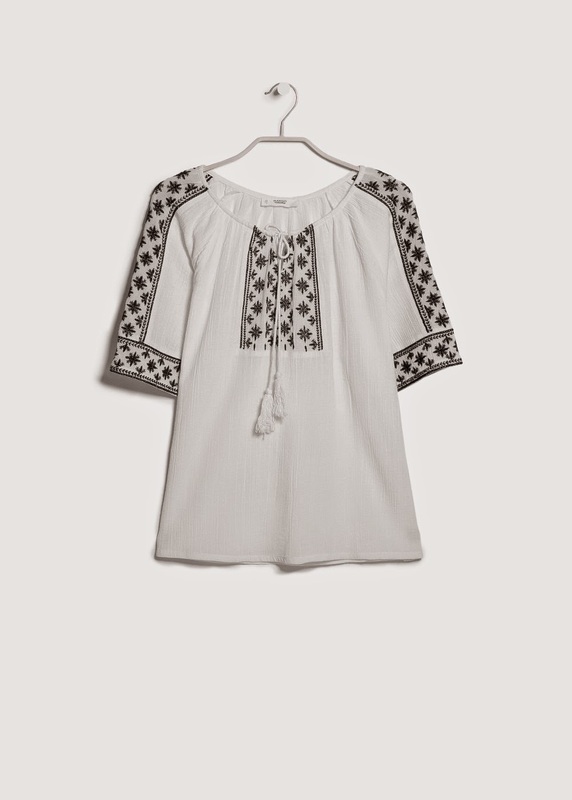 Along with this black top from Jigsaw, I also had one from Boden and they were so useful all through the summer that I wanted to add a couple more to my wardrobe for this summer. As to why they work so well? They can be loose without being maternity like, so they are good for those who want something that skims rather than clings, many have sleeves, the neckline is flattering on a larger bust as it can be left slightly open, they are neat over the shoulders so don’t swamp a smaller frame and they work with virtually all slimmer fitting summer trousers/shorts. I think that the main decision is deciding whether you actually like them or not. So far I’ve found the best selection to be at Mango. Zara has a few and whilst Boden had a great selection last year this year that doesn’t seem to be the case – yet. But for anyone not close to a City who wants to do a mass on line order, Mango offers the best chance of success. In all honesty I’m meant to be packing and sorting out for a few days away so I’ll keep this brief on words but more comprehensive on the pictures! 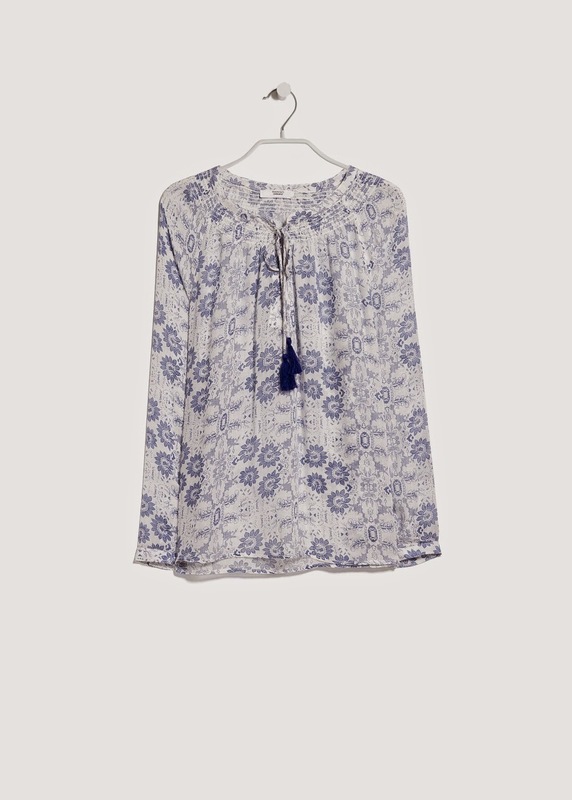 For my favourite blue and white colour combination, and for a top with the ubiquitous tassel, there’s this 100% cotton Mango printed shirt, (£34.99). 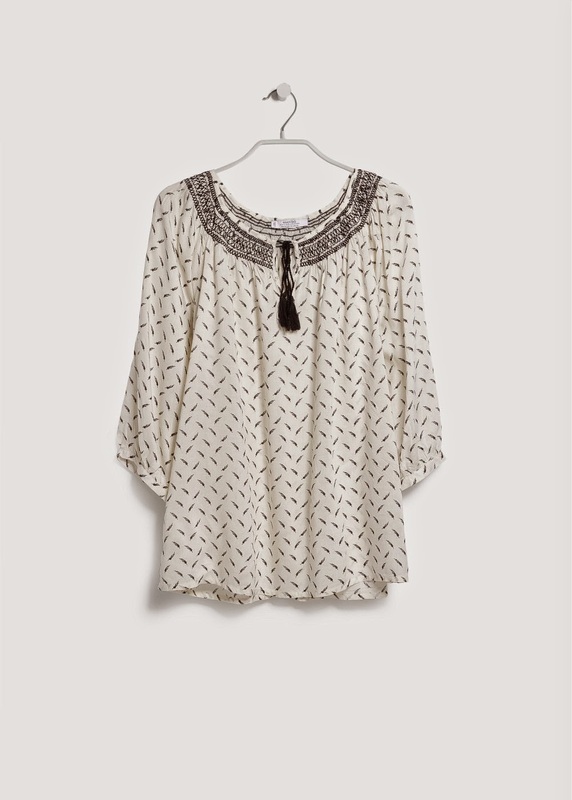 If both tassels and feathers are your thing – and for something not too far down the boho track, this Mango feather print blouse (£34.99) might just do the trick. 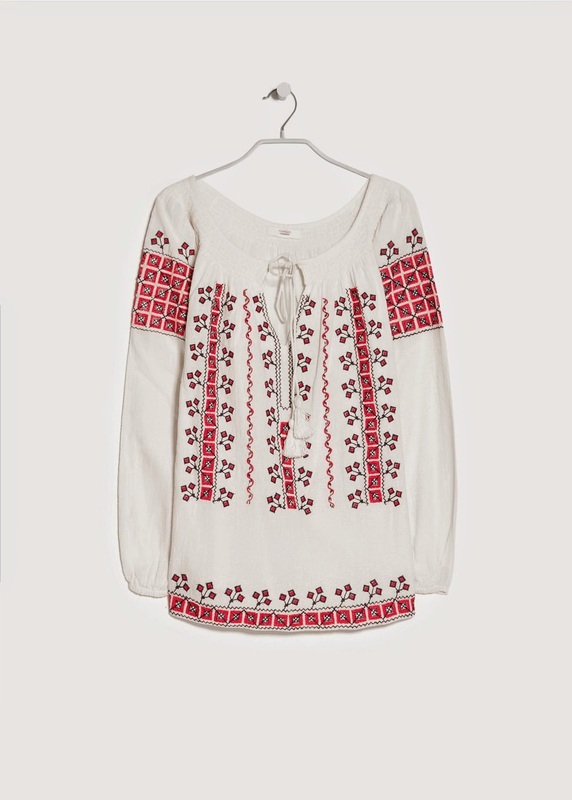 The Mango ethnic print blouse (£44.99) is also 100% cotton and it has more of a pretty ethnic/boho/folky look about it. 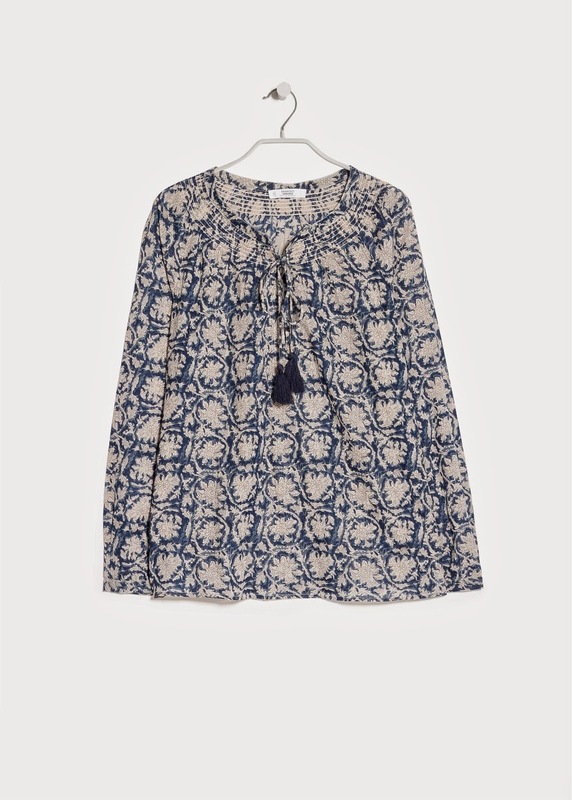 For anyone just dipping their toe into this style of top, the Mango honeycomb pattern blouse (£29.99) is a nice gentle introduction and not too full on festival chic. I don’t really like to use the word cute when it comes to clothes – or anything other than kittens really – but this Mango floral print blouse is just that. And finally following on from yesterday’s post, the Mango lonny girlfriend jeans (£34.99) look a good option in the white jeans department, as do the Baukjen white boyfriend jeans (down to £66 from £95). They have great reviews and five stars too so who knows, maybe they are the holy grail of white “not too skinny, not too see through, not too wrinkly, just the right length, waist fitting” jeans. Not really a tall order at all. And if I get lost under a whole load of packing (actually I’m more likely to be lost in amongst a whole load of Easter Eggs) then I wish you all a very Happy Easter and for anyone tucking into anything yummy after having given it up for lent – ENJOY! Previous Post The hunt for the perfect white jeans is on and has been for some time now…..any ideas anyone? Next Post However you look at this Topshop boiler suit and this Baukjen playsuit, they’re still onesies – the disguise doesn’t fool anyone!